Bruce Powers has been passionately working on Porsches since 1969. 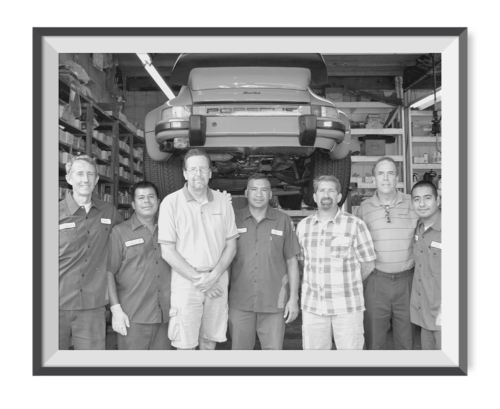 Along with Phil, Johnny, and the rest of his team at Autowerkes, they are dedicated to servicing your Porsche, BMW, or Mercedes with an unsurpassed level of personalized service and technical expertise. Autowerkes has been creating loyal customers that value personalized service, convenience, and the highest attention to technical detail. The past 36+ years have seen multiple generations of original, loyal customers still coming for quality service for their BMW, Porsche or Mercedes. Many of them (that moved out of the area) drive all the way from Palos Verdes, Manhattan Beach, L.A. and from the south in Newport Beach, Irvine, Mission Viejo, Laguna Beach, even as far away as San Diego, to have their car serviced at Autowerkes. Autowerkes adopted a team concept in the mid-1980’s. The idea behind the concept was to utilize the various backgrounds, strengths and experience levels of the staff to facilitate repairs and service for our customers that would be of the highest quality. Each person brought to the table a different set of experiences, different training by virtue of working at different dealers and brands, and different educational backgrounds. We utilize the concept not only with the technical aspects of each job of vehicle repairs or service but with the customer service routines, whereby we can meet a number of personal needs of each vehicle owner that makes the overall experience at our shop more detailed and thorough.